SAN FRANCISCO -- A San Francisco-based social media network created to connect neighbors in online communities said it is making changes on how members can report suspicious activity, after a group complained it was being used for racial profiling. "If you make it really easy to post anything, people don't have to think," Tolia said. "But if you insert these decision points it forces them to think about what they are doing." It's not clear how widespread the problem is on Nextdoor, but a handful of publications across the nation have written about racial profiling complaints from users of the site, with most of articles written in the context of the problems first reported in Oakland and Nextdoor's actions to address the issue. "Sometimes there would be posts about a black man walking by too slowly and they would take his picture and post it on Nextdoor," Porter said. 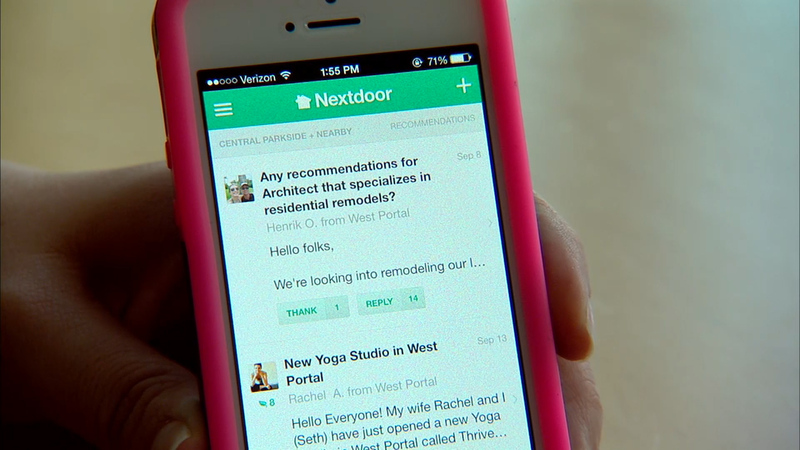 "The work that Nextdoor has done is truly groundbreaking and they were willing to meet with myself and members of the community and really dig deep to take on the issue of racial profiling and make real change in the way their users are posting," Campbell Washington said. "Maybe if they watch a little longer they'll see that people are just being in the world, just like them," Porter said.